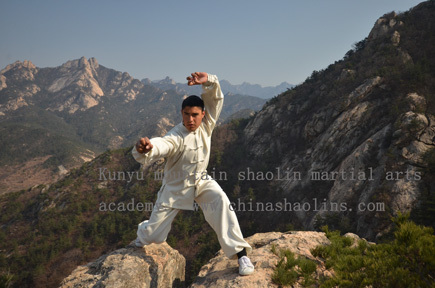 Kunyu mountain shaolin martial arts academy China Reviews from Jan to July in 2013. Thank everybody at Kunyu mountain academy for the great time I had here!I choose china study Kung fu because it is the birthplace of it. It’s also a nice get away from the daily slum that I have back home in the Netherlands. Learning your limitations and how to overcome them was my greatest gain .I also lost a lot of weight in the three mouths I trained here .My master was my biggest influence and he helped me a lot with training . When I thought I couldn’t do one more push-up he motivated me to do three. First of all the masters are very nice and helpful if you abide by the rules of academy. The translators are also very helpful and you can have a good laugh with them. The daily life here goes by very fast with all the training doing. The training is hard but fair. You see good results very fast but everyone has his or her own specialty.The surroundings of the academy are beautiful, especially during the summer when the mountains are lush and green , the water is really nice to swim in . In Yantai city there is a lot to do, just ask an older student to go with you if you want to. I just want to thank everybody at the academy for the great time I had here, so thanks everybody. Sander studied for three month shaolin kung fu here. I came to Kunyu mountain academy being extremely obese, my weight was 92 kilograms. At first my main goal in the academy was to lose weight. During the first half of my stay, Master Xu pushed me really hard. I really liked his training. I grew very attached to his sense of humour. His training was hard and his personality made me want to push myself harder. His Chen style Taichi is amazing, if I ever come back I would love to learn Chen style Taichi from him. I’m very grateful on the way he treated me. Thank you, Shifu Xu, for making me feel welcome. On the second half of my stay, I switched to the mantis group. I quickly felt at home because most of my close friends were in the mantis group, they were all training very hard and that gave me the motivation I needed. Mantis master is an amazing teacher as well as he is an amazing person. I’m surprised that he was very patient with me even if I made jokes during class. I’m very grateful that he didn’t lose faith in me, and that he kept on trying to teach me. He has my ultimate respect and appreciation. I only wish that I hadn’t caused him so much trouble. My master's kung fu is amazing. Thanks to him. I really liked mantis, I wanted to learn more. I will definitely come back and learn more from him, thank you,Mantis and bagua master, for making my stay in Kunyu mountain the best year of my life. 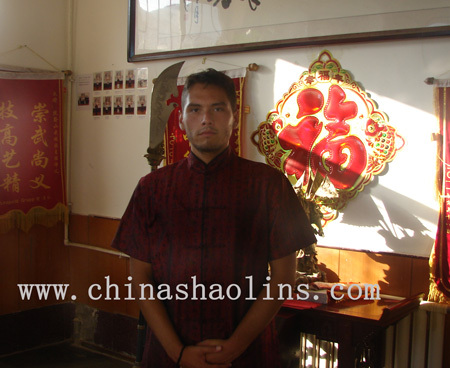 Carlos spent one year to study Chinese martial arts here. I chose China as the place to learn kung fu mainly because it is the only place where one can study Shaolin Kung Fu fulltime at an academy. I was motivated by my desire to learn Shaolin Kung Fu fulltime from a true master.My greatest gain would be a group of the basics I learned that formulate Shaolin Kung Fu as well as a greater practical understanding of Chi gong. Certainly the person who influenced me the most was my master. He was tough, fair, and seemed to truly care about the growth of his students. Master Xu was also a positive influence on me, and, of course my fellow students and friends I made were of great help in my learning, motivation, and enrichment.Training was hard but very good. The school facilities were all pretty nice. Daily life was centered on training. The masters were all pretty awesome and the translators were helpful, friendly, and hard workers.The surroundings are awesome, too! There is a Taoist temple that we go to every week as part of our training. Up in the mountain where the school resides, there are very few people and the mountains are absolutely grand, filled with clean, crisp air. Yantai city is a big city with a lot to do and its beaches are really nice. Also, there is a lake very close to the school which is great for swimming in. The national park is The national park is only 15 minutes away by foot and really quiet and beautiful. I spent six months to study kung fu here,Kunyu mountain martial arts academy is perfect place to study Chinese martial arts.My greatest gain is know my master, learn with him and always push myself mentally and physically. Tom helped me to be always motivated, and my master influences every movement and things.My master is great and translators are amazing. The place to learn is really perfect. It has been a life long dream to practice China Kungfu. And I have been postponing my dream for a long time because I believe that this practice of martial arts deserves a lot of commitment, attention and discipline, and with my daily life back in Toronto, Canada, Kungfu did not allow for such a demanding practice. So I have decided to follow my dream and devote 3 months of my life to study martial arts in the birth place-China! My greatest gain from my martial arts training is self confidence and peace. Getting in shape was a motivation for my practice, but it became a novelty. My master is my greatest influence in my training. He really embodies the qualities of a martial artist: discipline, self control, patience, respect for oneself and others and peaceful. He leads by example and I will always grateful for his influence. The academy itself is a terrific place. The people who travel form all over the world to train here benefit from many things as I have. The translators are all very friendly and helpful. The food has been very delicious and the dining hall is very tidy. All the shifus are very skilled and are true professionals. They seem to me very sincere about teaching. Outside of training, the students are very helpful towards each other and also pleasant and kind. I love the surroundings of Kunyu Shan (Kunyu Mountain)! It is an ideal atmosphere for peace and tranquility. The local people are lovely and have working a great example for us martial arts students, it reminds me that beauty and serenity just does not appear… it must be maintained daily with joy and contentment. Thank you, thank you, and thank you to the wonderful staff of Kunyu mountain shaolin martial arts Academy!! My experience here has been some of the best in my life. I will be forever grateful. Blessing, may peace with you. Olivia studed Wing chun for three months here. I decided to come to China as it is the birth place of kungfu and probably one of the only countries where you can learn proper traditional Shaolin kungfu. Also as I studied martial arts when I was younger I would like to come to China to experience the feeling to train in this country. My fitness and flexibility have increased greatly. I have also discovered Qigong which I intend to continue practicing in the future. My roommate Nathan has helped me a lot on the daily life in the academy and also to integrate with others. Other students have influenced me by seeing how hard they trained which helped me to push myself. Julien also helped me a lot on the Taichi. Overall all the students have been very helpful. The training schedule is well planned and I really appreciate Taichi and Qigong in the morning. It is also really good to have a strict training and attendance to the training daily life in well scheduled with the training and it is good to live in a community ambiance in the academy. Everyone is helpful and very friendly. The masters are very good, and I really liked the teaching of my master who always pushed me hard to train. Translators have been really good too and always helpful. I was excepting the academy to be higher in the mountain. The surroundings are good. It is a pleasure to be able to go for a swim in the lake and go for a walk in the mountains. Yantai city has everything that we need .You can find good food and some bars with expats and nightlife there. I followed two friends from Denmark, which chose this academy. Greatest gain I think would be “the Kong-fu way of life” Master Gao is a great teacher and taught my group well in that subject among. My entire group was great helping each others every day. Great atmosphere! My master especially was great correcting where correcting was needed and just all in all fantastic teacher. He did a great effort to make sure that every one of his students had a pleasant stay at the academy and he was very helping. He gained my respect! Great academy! Really great training, good mix of endurance strength and flexibility. Everyone was nice and made a lot of new friends. Sarah, Rachel, Nancy, Elle and Larry did a great job as translators and were great at helping when needed. If I ever came back I hope that My master would train me again. Best teacher ever. Loved the surroundings of Kunyu moutain academy, so beautiful and nice with fresh air all the time. 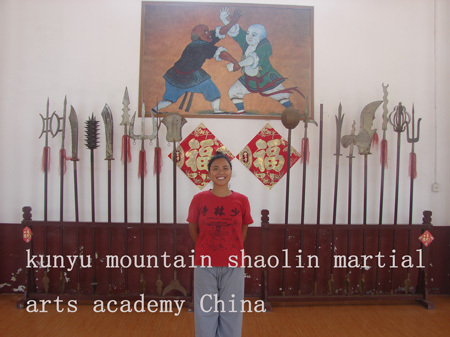 My time in Kunyu Mountain Shaolin Martial Arts Academy was amazing. I finished high school and wanted to do something else before I started my study at a university. I was always a fan of martial arts, and that was one of the reasons to do kung-fu in China. I wanted to go to China for already two years before I actually did go, so I had a lot of time to check out all the schools. This school came out because of the many pictures, students reviews,and clear website. China is of course the best place to go for kung-fu, so that’s the reason I came here. I learned a lot in the four months I have been here. You not only learn the art of kung-fu but also the way of living, get out of bed because you have to train and go to sleep early because you have to train the morning after. The biggest help came from master. He liked discipline and that was exactly what I needed. Because of his hard training I got myself in a great shape and I learned kung-fu, what I came for. The experience was the best I had so far. You start every day in the morning with all the students and masters. After that you have your own class for the rest of the day. My Shaolin kung fu master was really good. In the beginning you have to get used to his way of teaching (hard), but if you want to learn the most, join his group. Hard training shows results. The translators are also really friendly and master English very well.The surroundings are also really nice. I went to Yantai almost every week to an Irish pub called Druid’s. I really liked the place, good environment. The big shopping mall AEON will also be remembered forever, with all the western stuff like McDonalds, Subway, Pizza hut and KFC. Every Friday afternoon you go to the temple nearby. There we climb a small mountain six times, which is a really nice area. I thank everybody for my great time here and I hope I can get back sometime. 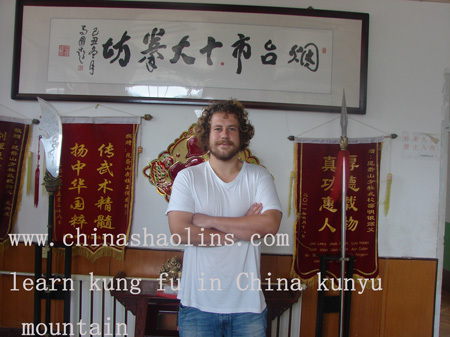 Peter train kung fu in Kunyu mountain shaolin martial arts academy China for three and half months. Jonathan was the one who originally got the idea because he knew a guy who had been in Kunyu mountain shaolin kung fu school. And because I have always been training martial arts it was easy for me to decide to go with him. Except from the amazing training master gave us, the greatest gain must be the way he always told us to not just be fast at training, but take what we learned from training and use it in our lives. My shaolin kung fu master has been very caring and helpful since we arrived. Not just with the training but also the way he is always telling us to let him know if we have any problems or questions. Everybody in the school has been very friendly and helpful if we needed help with anything.The entire stay has been an amazing experience. The training has been pushing us in a way we have never tried before. All the other students have been so nice that the daily life has just been a pleasure without exceptions. The masters are all incredibly skilled. 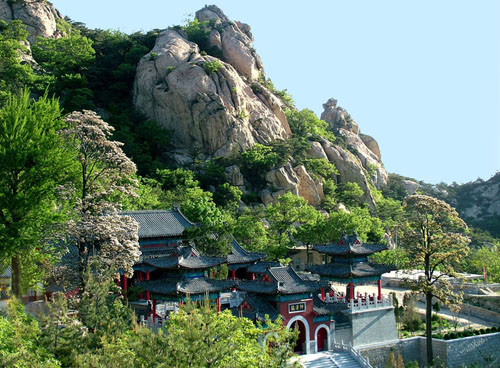 As for Gao Shifu he is an exceptional trainer because he is as skilled as he is, and also because he has the ability to look at one student differently from the others, and he knows that every student has to be trained a bit differently.The surroundings are amazing!!! The temple at the mountain is so beautiful. It’s been a true pleasure to wake up to the view of the mountain every morning! 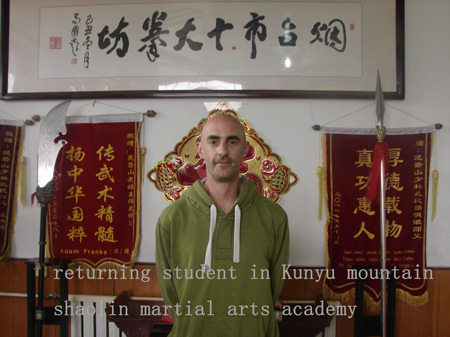 Daniel studed shaolin kung fu for two months in Kunyu mountain. 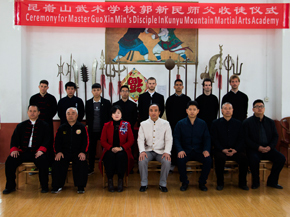 In order to experience Chinese culture and study Kung fu in the country of its origin,we came to kunyu mountain shaolin martial arts academy to study.We spent a year to study Mantis bagua kung fu in Kunyu academy. We benefited a lot , fitness, a fuller understanding of Kung fu, more coordination and more balance between internal and external self. The Master for his encouragement，instructional manner and making The Mantis Class feel like a family but above all his Patience. Many aspects of the martial arts training, the awesome scenery, hard training but also very fulfilling. All of the masters and translators friendly and respectful.The surrounding of academy,Maintains, lakes and the temple are beautiful. People of the district are very friendly. Yan-tai is a nice city with lots to see and do.We would like to say a very big Thank you to all Masters, Translators and staff for making our Kunyu-Shan (Kunyu mountain) experience the one we will never forget. 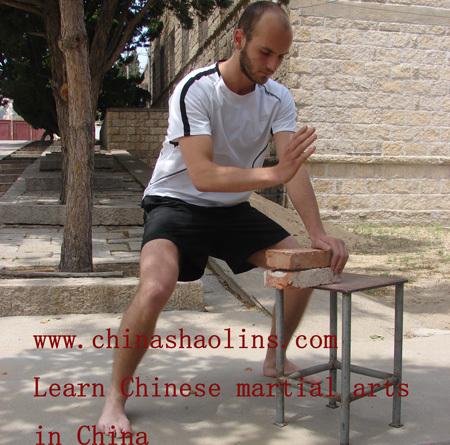 It is great experiences to study martial arts in China. We will miss you all so much especially our Master who has made a lasting impression on us, we will always remember you with fondness. Nadine and Tony spent one year to study martial arts and Chinese culture . Returning student:Three weeks in MAY 2013 -----Laurence learnt for one month in last year 2012. I wanted have been studying karate for quite a long time, karate is a Japanese martial art coming from Chinese kung fu. I wanted to know the roots of karate and decided to begin studying Chinese kung fu. I chose China to study because kung fu is Chinese so I think there is no better place to study it. I am also very interested with Chinese culture and language.My greatest gain is I think to study with Mantis master who is an amazing shi fu(shi fu mean master in Chinese). I have big gain into physical moving easier than in France because I have nothing else to do than training.A lot of people influenced and helped me during my stay at the academy. Masters of course, also translators make our life simpler. The other students help me a lot to being always very kind and ready to help.I am coming for the second time and I will come again as soon as possible. The way I feel is very different from the first time because I knew how it was before coming, it was more than “coming back to visit friends”. The training is good, well balanced between techniques and physical training. All masters are amazing in their specialism. My mantis &Bagua master who is the one I train with is really as I think about a master. First of course he is more than good at his practice, but also very kind, very good teacher, patient, and make us do as good as we can. Translators are all very helpful and kind. The surroundings are very quiet. It is very pleasant to go for a walk or swim all around. He was returning student who studied for three months kung fu in 2011. Since china is the birthplace of Kung fu，there was no better place to visit. My motivation was getting back in shape and visit old friends. My greatest gain was probably been physical, lose weight and gained stamina. But the optional classes like Taoism have broadened my horizons. I think my master influence and help me most，he showed me what you can achieve by training hard，but also other students like Julian and Clement have a lot of experience. Life in Kunyu mountain kung fu academy is a good life. 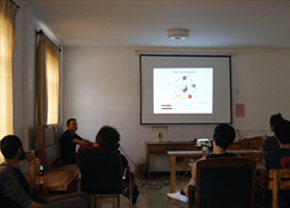 Training hard in the classes，helped by amazing masters and good translators，builds you up. They help you to make as much progress as possible. So there is training for young and old.The surroundings can’t get any more beautiful. The school lies in a valley full of fruit trees，surrounded by mountains. It doesn’t get better than this，you have a nice lake to swim in during summer，healthy air and mostly good training weather. Even Yan tai city with its shops and restaurant is appealing ，but the beach is my favorite in Yantai. Kris van returned to study martial arts . 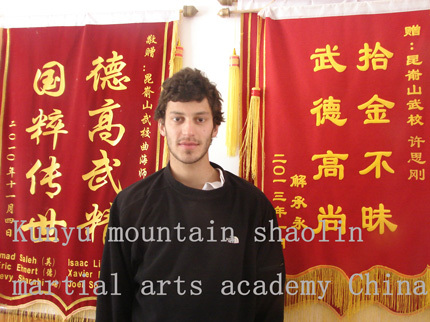 Kunyu mountain shaolin martial arts academy China Reviews - one year course. I had always heard of the power of Chinese Kong fu but I never had the opportunity to study it before. I studied Thai Boxing and Wrestling but I was looking for martial arts that were more internal and even mysterious. I decided that taking a year off from work and going to china just to focus on training would be the best way for me to study; I really wanted to give myself completely to training. Reading martial arts books, especially from Bruce Lee, inspired me to this martial arts journey to better myself and express myself. My greatest gain is learning the value of hard work and discipline. Kong-fu taught me that if we wanted to do something, we must work hard at it. I learned to control my feelings and emotions and to work through adversity. Big and little Sam helped me through training and inspired me to train hard. Tony, Suschant, Andronikos, Jacob and many others who practiced well. I enjoyed my time here,it is great place to study kung fu in China I came from no knowledge of Kong-fu and now I feel I know a bit about it. I know it’s a long road but I’m glad I could practice. Training was challenging and motivating. The masters and translators were wonderful people. I enjoyed watching the masters with their students and the translators were always helpful and kind. Yantai (the city we located )is a nice city, some sights to see. 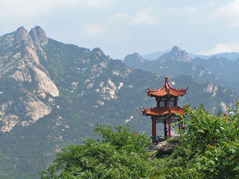 Kunyu Shan (Kunyu mountain )is beautiful, I never got bored of looking at the mountain they are beautiful. Winter was cold outside but challenging, the summer is the best for training. I am blessed for being here and meeting such wonderful people. I learned about Kong-fu and about myself, I thank my shifu (Shi fu mean Master )and all the masters. Orlando spent one year to learn Mantis and Bagua in Kunyu since April 2012.. The main reason why I decided to come and study kung fu in China Kunyu mountain Shaolin kung fu academy was to overcome my limits both mental and physical. This includes the relation to Qi (internal Chi)and internal strength. In France, life in most part of occidental countries few people believe in the hidden potential of their body and I wanted to find some back, try and experience it. Apart from flexibility, I would say my greatest gain was the internal approach of the Qi (Chi). I felt really interesting imagination while meditating and I will try to keep it as a daily ritual. The greatest influence while studying in kunyu Kung fu academy was of course my master. I particularly appreciated master’s kindness, patience and sense of humor. 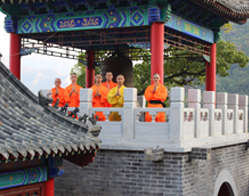 The surroundings of Kunyu mountain shaolin academy are great, like the temple and the mountains. It is a perfect training environment if you want to go for a hike. This academy was a very good starter for a martial arts training. It gave me the idea that I might to develop it in the future.Thank you for everything. Thomas are able to break briks by one hand without any injuries by Chi Kung. 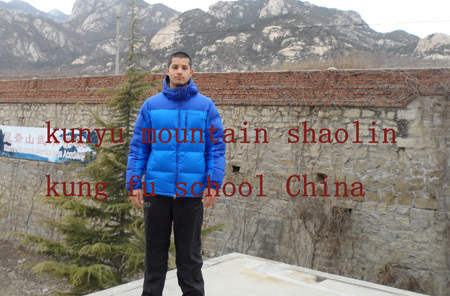 My reviews of kunyu mountain shaolin martial arts academy China.I studied here because I wanted to live the full experience of martial arts, learning them from shaolin masters. I got a new perspective of life and learned a lot about myself.My shaolin kung fu helped me and taught me several and important things. I am really satisfied that he was my master here because he showed me my weakness so I can improve a lot when I continue practicing martial arts. He is a really respectful person that can push people beyond their limits. I stayed for 5 weeks and what I can specifically say about my experience is great.For traning,it was hard so I could see my improvement just in days. Masters want us to do the best we can. The training exceed my expectations. The daily life was really good. People were very respectful. The room was very comfortable and there was no problem with the restrooms.The masters at Kunyu very respectful and really dedicated to teaching what makes the students improve as much as they can. The translators's the English level is really good so I didn’t have problems at all understanding what the master said. The academy is located in the right place around lakes, mountains and Taoist temple that makes the experience of learning martial arts in China better. The city Yantai is very calmed and nice. There were several things to do in it. Andres studied two months martial arts here. The very complete training in kunyu mountain shaolin martial arts academy China what we receive.shaolin Master and internal kung fu master helped me a lot. The training time of Kunyu mountain is perfect.It would be good to have a room where we can drink tea with friends in the evening. The masters and translators are great and are doing a very good job. The surrounding of the academy in Kunyu mountain is perfect.Thank you for this time here. Marc stay three months here. I went to China to learn kung fu in because it is the only place on the planet where I can learn authentique and good martial arts.My physical body is stronger, my mind is too. And it is infected into my life.My master influenced me and helped me, my classmates too. The weeks in school are all organized. The training is strong enough for me. The translators are great and kind. All the masters are great and have amazing skills.The mountains are beautiful, the school space is big. The nature around the school is very nice.It is a great place to study kung fu in China.Yantai city is a nice town. I chose China to study martia arts because I think Shaolin kung fu was born here and this is the place where I can find the best kongfu.My greatest gain is my mind, it’s become stronger. My body is more healthy. I learn the way of never giving up. My Shifu (Master) helped me a lot. He pushed me to go more and more. I’m thankful to him for his training and his behavior with his students. His training will stay for ever. Some students helped me too of course.Kunyu mountain academy is great place to study martial arts! The translators are great in English and very kind. The masters are very awesome. The day organization is good, the week programme feel good too. The food is good.The area around the Kunyu academy is great. The mountains are beautiful, big mountain running is awesome. The school is perfect, lots of places to train. My experience at Kunyu Mountain has been one of great importance in my life. I stayed here to learn kung fu for ONE year.I came to China to study Martial Arts under greater masters of Kungfu. I also came to experience the life style of what it is like to live under such simple conditions. Life in Kunyu Mountain is for the most part nothing but Kung fu training, but more than that it’s about being open to the teachings of the great masters that guide us. They teach you about Chi the fundamental aspect as a martial artist. You learn that there’s two sides to every coin. (Ying and Yang)and you learn to utilize that in your daily life. The surroundings of Kunyu Mountain are beautiful during the summer. There is an old saying “one must first learn civility before he can learn the art, and one must first know the ethics before he knows his skills.” Cavity refers to good manners, courtesy, respect and consideration of others. Ethics, on the other hand, is a fundamental set of acceptable behavior which codifies the spirit of martial artist can rely on to cultivate their body and mind, and to guide their every day actions and judgement. The masters here are devoted to this ideal and in return it influence on the students. Kunyu Mountain school has been a wonderful experience.I highly encourage anyone to experience it first hand. 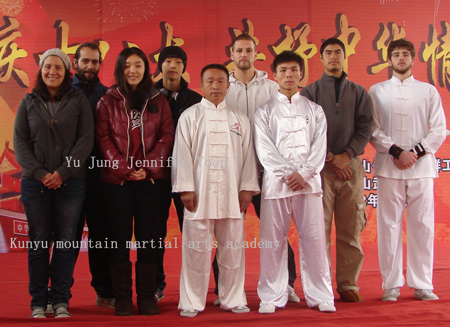 Yu Jung Jennifer Yoo learn for three months from 2012 Jan,and she returned for another five months kung fu learning from 2012 Oct to 2013 March in Kunyu mountain shaolin kung fu school. I always wateched chinese martial Arts movies with my family since I was very young and I was very interested to trying the chinese martial arts ,my own.I learned now to live in community of school,because I never lived without my parents and I think it is very good experience for me.And I never tried activities like martial arts, so I think it make my mind healthy and focus,so I chose to come in Kunyu mountain kung fu academy to learn shaolin martial arts. Most probably it would be all the masters and translators to help me a lot.And other many friends. They talked to me I talked to them so we communicated. But , I would say my master helped me much more. I like to wake up in the morning and do hard kung fu trainings everyday. And all the masters are so supportive.. And all the translators are very kind and I really like them. And I really love kunyu mountain academy for make me do hard works and make me independent. I love the natures around the Academy in Kunyu mountain. In mid of November 2012,Yu June take part in Art Performances Show to play guita and sing to celebrate the 18th Communist Party of Chinese National Congress. I came to study Chinese Kung fu in china for various reasons. AS a novice in Chinese martial arts, I wanted to experience the authentic, traditional tea things from its home. 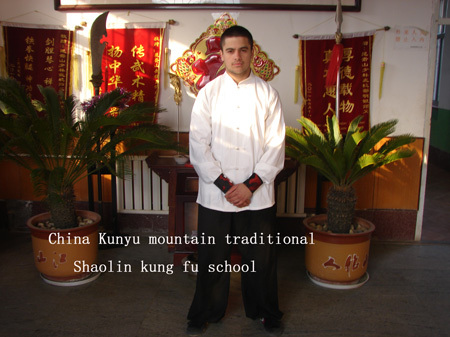 I was also attracted to learn Kungfu in China because of the exotic notions I had of China and wanted to experience meeting the people have and seeing this beautiful country,then,I came to Kunyu mountain shaolin kung fu school. What I didn’t expect was to find such a great commitment and dedication from the kung fu masters, translators, kitchen stuff, cleaning stuff, taxi drivers, to walk my learning experience as challenging, fulfilling, safe and enjoyable as it turned out to be. There are some very, very strong, talented and good martial arts students, here at Kunyu Mountain academy, but as good as some students are, when you see how good the kung fu masters are, one comes away with a new appreciation for the depths of talent in martial arts here. One of the most profoundly lucky that happened for me here was meeting my roommate. He was a man less than half my age who came from England, having recently studied long as a physical trainer. He helped me greatly &generously to help me get fit and lose about 351bs. So many students here are like that, they go out of their way to help one another here to train. They become great friends! Your time at Kunyu school will make your body change for the good, and it can happen quickly. You can get up at 5:30 am and train until 4:00 or later. The intervals between breakfast, lunch and dinner seems just about right. There is also time for your body to rest during the day. The masters can provide more than enough or just enough training to satisfy everyone. 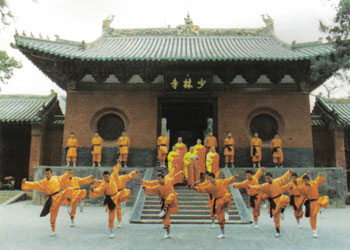 \And yes, kunyu mountain shaolin kung fu academy is in a very beautiful and rustic setting. In the fall the surrounding countryside is filled with the most delicious apples. The mountains are spectacular. On the weekends we would go to Muping (the town we located)for a medical massage that helped greatly. After that we would go to the supermarket to buy our favorite foods for the weeks training and stop off for lunch. Taxi fares, bus fares are all very affordable. 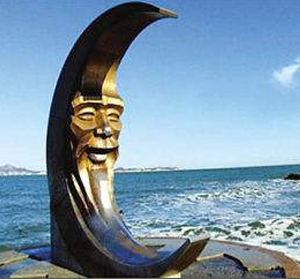 Yantai is a very nice big city that has a few local favorite bars for a great life. 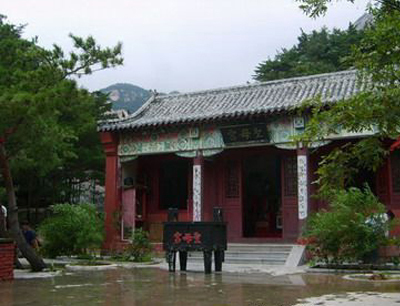 You can stay here and fall in love with the place!Good place to study kung fu in China. All the best in your martial arts training. James spent about four months to study here. I wanted to continue to learn wingchun at Kunyu mountain shaolin martial arts academy and had an opportunity to take time away from the UK. I have improved my flexibility, strength, peace of mind by learning wingchun. Master Guo, Tommy and Jeff helped me a lot. I have a fantastic time here again. I return to this academy because I expect a great time every time. The training has been good. The surroundings is beautiful as always. 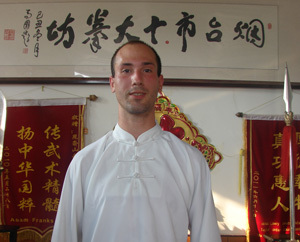 Kristelli Andrey learned shaolin kung fu in 2012 August. This time,he will learn for another three months from Feb to May 2013 at kung fu class. China it is the place where kungfu was born. My friends and my master helped me a lot.Here everything at KUNYU mountain shaolin kung fu academy is really good, I am really happy to spend some time here.I liked a lot to learn shaolin kung fu here. Nature is beautiful, lakes are clean and nice, the air is fresh. Yantai (the city we located)is a big good city.